Investing in Leaking Shower Pan etc. Yes! Why? It will be cheaper to repair the leak now rather than wait until later. Mold can grow in many places that are not visible to the human eye in the indoor environment. Although we live in the desert mold can & will grow if there is a constant water source. For example: a leaking shower pan, shower valve, leaking toilet or sink can all lead to mold. It’s important to identify where these leaks are coming from. We all know by now that mold can cause allergies & other health issues. What you may not realize is that mold remediation is a costly process. The cost of re-constructing the entire area affected can also be very significant. For example, we recently had a client who suspected that there was a small leak in his shower. He told us he had suspected this for the last two years. By the time he contacted us & we inspected the shower, there was now major mold growth & wood rot. As this shower was on the 2nd floor, the damage not only included the bathroom floor, now the hallway & the ceiling of the downstairs bathroom & kitchen plus walls downstairs were affected. Mold remediation on this particular job cost over $4,000. He now had the additional cost of the wood flooring in the hallway, new sub-floor in the bathroom, new ceilings & walls including texture & painting. If this client would have contacted us two years earlier he would have only had the cost of remodeling his bathroom shower. If left unchecked that leak can often cost more in the end. 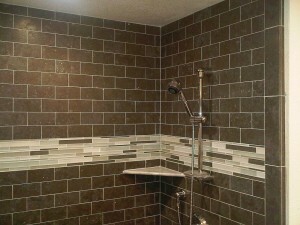 On a positive note remodeling your bathroom now will add beauty & value to your home!